We wanted to let our customers know about something important while there was still time. Currently, we accept three payment options: Paypal, Stripe and Amazon Payments. We were notified by Amazon Payments a few months ago that they would be dropping support for their service and it would not be available after May 31st. This was certainly irritating news for us as half our payments came through Amazon payments and it was great to offer an alternative trusted way for people to pay for their t-shirts. Sadly, Amazon is closing Amazon payments. We don’t know why but they are trying to push everyone to a new payments service which we don’t like and requires more backend development that we’re capable of doing – it also changes the ‘flow’ of payment at checkout. So, we can began looking for alternatives and signed up with Stripe – which we’ve been using for about two months now. It’s fantastic and now half our payments are going through that. So, by attrition customers made the choice for us. We will keep accepting Amazon Payments until May 31st, at which point we will have to shut it off. About 1/3 of you still pay with Amazon Payments, so we hope that this transition will be painless – if you don’t have a Paypal account or refuse to work with them (many people do) then we recommend selecting Stripe at checkout – it’s crazy easy – all you do is enter your credit card info and your order is securely placed. We’ve been running Anglotees for over a year now and we occasionally get questions about how we print our shirts and questions as to why don’t use a particular process. We’re going to try and address those questions in this post and will use this as future reference point for these questions in the future. Most of our shirts are printed using the silk screen printing process. We use a factory locally to us in the midwest. This is process is simple, each color is printed through a screen onto the garment. This is the most economical way to print the large quantities of t-shirts that we print on a weekly basis. This is also how MOST t-shirts are printed, even the ones you find in the store. The only drawback to this process is that if the design has a lot going on with it, a lot of ink is used which can give a plasticky feel to the shirt. We try to counter this by keeping the designs simple. Usually, after a few washes the plasticky feeling washes away. Screen printing is also the longest lasting of the various printing process because you’re permanently putting ink on the garments. We have a secondary printer we use when an order is messed up and we need small quantities reprinted. Direct to Garment printing is where a shirt is fed into a physical printer (like your printer at home) and the design is directly printed on to the garment. This is a neat process and there are more color ranges available when printing. However, it’s a time consuming process so is not suitable for large print runs (we print 200-300 shirts a week so it just wouldn’t work). From time to time, a shirt will arrive damaged from the screen printer or there will be something wrong with the garment and we just can’t send it to the customer. In situations like that, we often have it reprinted using our secondary Direct to Garment printer. We’ve gotten lots of questions about why we don’t use the printing process where the design is dyed into the garment. This is called heat transfer and what happens is heat is used to transfer the ink into the garment, dying the garment. This makes the printed design become apart of the garment. This is a cool process and it’s less plasticky than screen printing. However, as with direct to garment printing, it’s a very slow and laborious process so we can’t use it for large quantities. 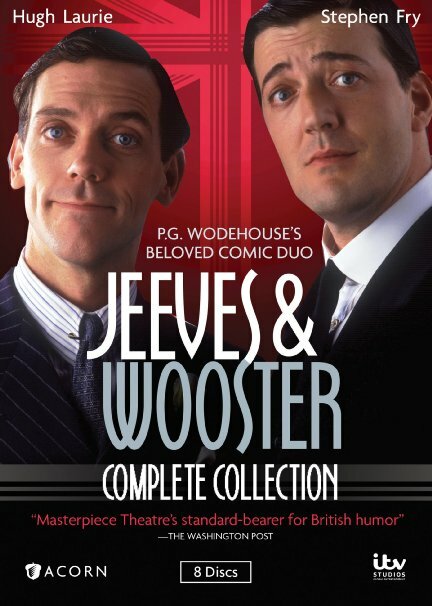 We have a great giveaway this week – a brand spanking new copy of the new Jeeves & Wooster Complete Collection on DVD. This contest is open to USA & Canada (sorry everyone else, this DVD is region 1). 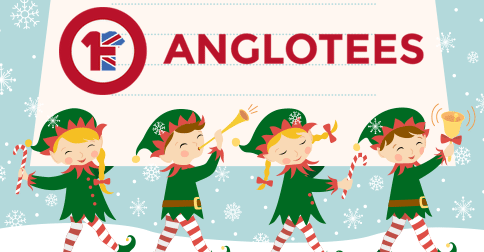 To enter you simply need to fill in the form below and sign up for email alerts from Anglotees. You’ll get 2-3 emails a week from Anglotees – one launching the new designs every Friday, one last call email every Thursday and occasionally a special announcement for a sale or special offer. Your email address will not be sold to a third party. 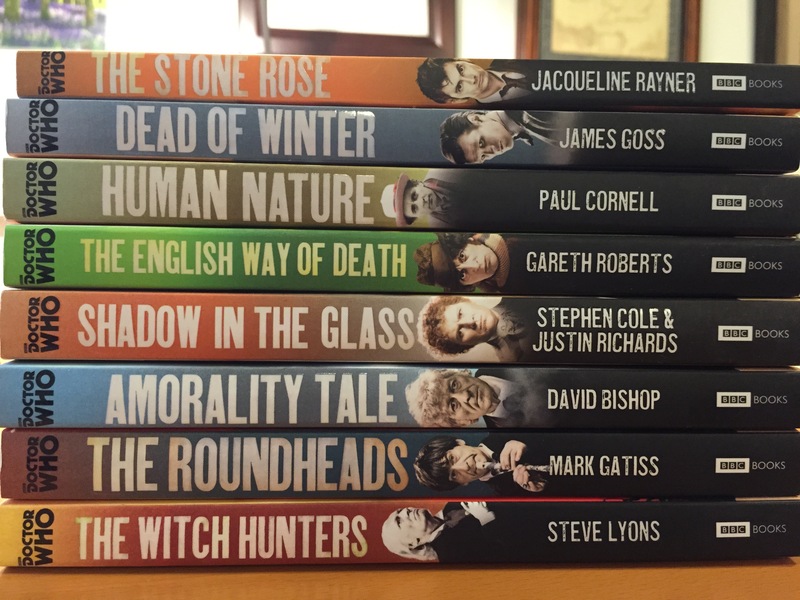 If you’re already subscribed – don’t worry – you can still enter! 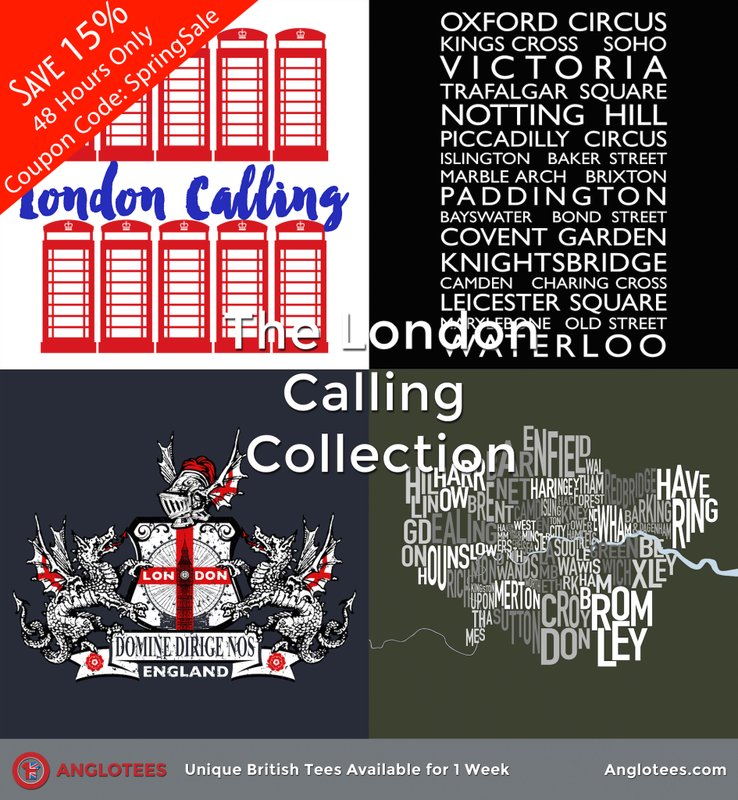 Spring Sale – 15% Off Your Order for the London Collection – 48 Hours Only! Happy Spring! To Celebrate we’re offering up a limited 15% off your purchase sale for 48 Hours Only! Use Coupon Code: SpringSale at checkout to save 15%! Anglotees Now Takes Credit Cards Directly on the Site with Stripe! 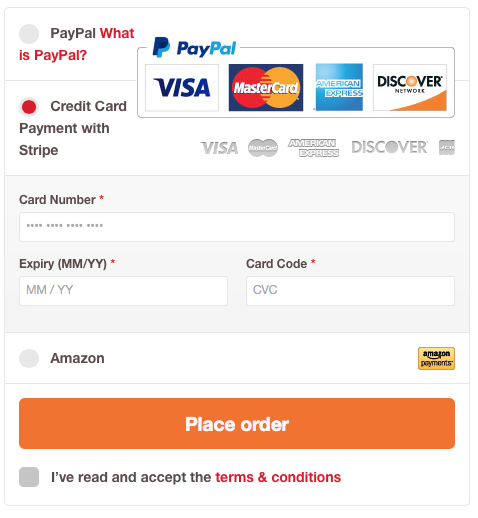 Good news everyone, Anglotees can now take your credit card directly on the checkout page using the service Stripe. When we started Anglotees, we had two options for payments: Paypal and Amazon Payments. We’ve generally been very happy with both, in fact we still prefer people pay with Paypal as their first option. Amazon Payments is another story. Amazon is phasing out Amazon Payments and forcing us all to move to a new service. While I plan to move to it, the transition is more involved than just updating some settings. We’ve also been wanting a way for people to enter their credit card info directly into the cart at checkout – as it makes the checkout process frictionless. People are more likely to finish their order if everything happens on one page instead of being taken to a third party to login and pay. So, from today you can enter your credit card information directly on Anglotees when you checkout. We’re using the service called Stripe which is a popular and secure way for small merchants to take credit cards without the hassle of a merchant account. Just Select ‘Stripe’ at Checkout! We take the security of our customers’ information very seriously. Anglotees is protected by SSL so that all transactions are secure. While we will now be taking credit cards directly on our site, WE DO NOT EVER COME INTO CONTACT WITH YOUR CREDIT CARD INFORMATION. When you select Stripe as your payment option and enter it, it is sent directly to Stripe for processing using a secure SSL connection. They verify the payment and then communicate the successful transaction back to us. We DO NOT store your credit card information. However, you can select the option for Stripe to store the information on their secure servers to make checkout in the future quicker.